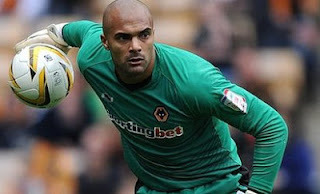 Wolverhampton Wanderers goalkeeper Carl Ikeme has announced his retirement from football after a year-long battle with acute leukaemia, the English Premier League club said on Friday. The 32-year-old who was Super Eagles’ number one goalkeeper has been with Wolves for his entire career, making over 200 appearances for the club. “I spoke with the doctor and he suggested I should retire, because of the toll the treatment has taken on my body,” Ikeme told the club website. “He thinks it’s what is best for me and I can’t really risk trying to come back. My health is the priority. Ikeme was diagnosed with acute leukaemia in July 2017 but entered into complete remission only last month. Last month, he had announced on his twitter handle: “After a tough year and intense chemotherapy treatment, I would like to let everyone know I am in complete remission. Ikeme was in goal for Nigeria’s first three matches of the 2018 FIFA World Cup qualifying series. These were the home and away ties against Swaziland in the preliminary stage, and away to Zambia in the opener to the group phase campaign before being diagnosed of acute leukaemia. His first cap was in a 2017 Africa Cup of Nations qualifier away to Tanzania in Dar es Salaam in September 2015.